The Cyclops Leech is designed to get down and keep a profile while moving like a snake. 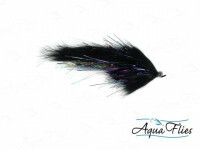 With the 7/32" tungsten bead, this fly will break through the toughest of currents. Rigged with a Gamakatsu Octopus hook. Nice fly, swims with lots of movement.